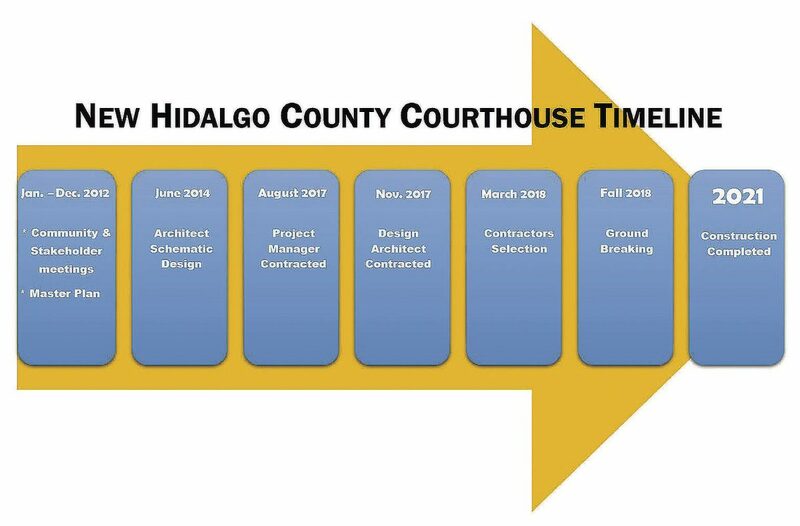 It’s hard to fathom that only one building contractor placed a bid to construct the new Hidalgo County Courthouse — one of the most expensive, single-building public construction projects to date in the Rio Grande Valley. But that’s what apparently happened, and that’s how Morganti Texas Inc., based in Houston, on Tuesday was officially given the contract by Hidalgo County Commissioners. Not only was Morganti the only contractor to place a bid for the $150 million new courthouse project, but it was the only company to place a bid twice, County Judge Ramon Garcia told us. County staff opened bids Jan. 6 and after Morganti was the only to respond, they took it out to bid again on Jan. 13. But once again Morganti was the sole bidder. This time, however, the company responded with a bid $500,000 less, Garcia said. Well, bad on the other companies. Why didn’t they vie for this project? Could it be that years after commissioners first began soliciting schematic designs and plans, they still have yet to nail down a design or a firm cost bottomline? Could it be that a solid commitment for $30 million promised by the city of Edinburg still hasn’t been negotiated? Could it be that politics and the landscape of changing commissioners and new county judge have deterred builders? Could it be they have too much work after Hurricane Harvey? Whatever the reasons, we certainly hope that the county is getting the best deal and quality construction possible on such an expensive project that is to last our region for generations. 2.2 percent is well below the 4 percent industry average. And Morganti has reduced its fee for additional work — in case the project exceeds the estimated time frame or scope — from 4 percent to 3 percent. How good of a deal will depend on the total cost to build the courthouse. On Monday, cost estimates discussed for the building were $127 million, not including architect, furniture, soft costs or construction manager fees. But McIntyre told us they are trying to keep it at $113 million. With so many ifs surrounding this project — one that many people oppose — we urge commissioners nail down a firm cost as soon as possible from the architect and builder. Then set a firm budget and stick to it.